In April 1997, Montreal-born, Halifax-bred PBS anchorman MacNeil, of The MacNeil-Lehrer NewsHour, raised his right hand in a Manhattan INS office and swore to""renounce and abjure all allegiance and fidelity to any foreign prince, potentate, state, or sovereignty."" This act was the culmination of a lifelong search for national identity for the self-styled""Anglo-Canadian-American."" Shuttling between the BBC and NBC during his early career, for years MacNeil yearned for an environment more stimulating than his famously reticent homeland, yet never felt fully at home in England or the U.S. However, after 20 years (1975-1995), MacNeil's identification with New York City was solid. MacNeil found himself unable to yield entirely to the sometimes lovable, sometimes irksome American egotism, but after September 11, he discovered his emotions had caught up to his somewhat intellectual decision to become naturalized. In his customary cozy and elusive manner, MacNeil here treads lightly regarding his own motivations. 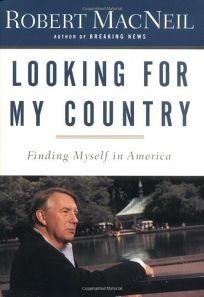 Part memoir, part rumination, this slender volume contains many newsy anecdotes, which sometimes detour from his progress in yielding to America's charms. That some of these stories appeared in MacNeil's 1982 memoir The Right Place at the Right Time reinforces the impression that this is not truly a book-length subject. Still, this is a thoughtful and intelligent examination by a nationally famous import who found his place in a land of immigrants.